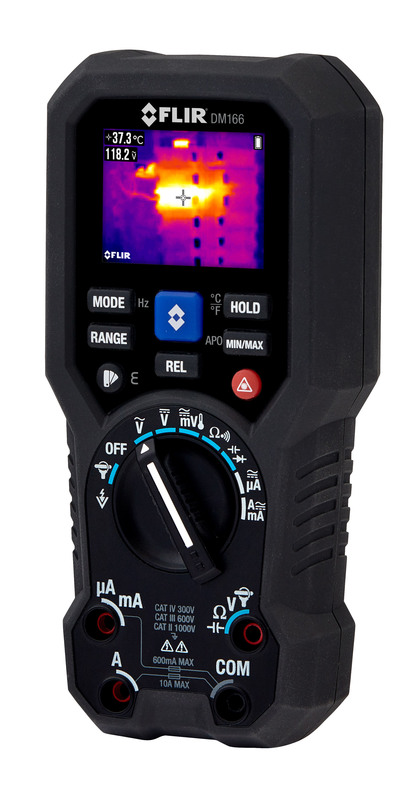 Flir recently announced the Flir DM166 thermal imaging multimeter with infrared guided measurement (IGM). 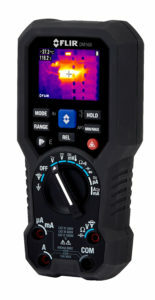 The device features 80×60 thermal resolution, broad multimeter test functions, and the flexibility for use in both high and low voltage applications. Designed to provide faster troubleshooting in applications such as electrical distribution, electro-mechanical systems, HVAC/R, and electronics, it employs a Flir Lepton thermal microcamera core that visually guides users to the precise location of a problem. The multimeter helps users pinpoint issues faster, and then troubleshoot complex electrical distribution and electro-mechanical systems more effectively and efficiently. Thermal imaging is a non-contact temperature measurement method, allowing the user to more safely scan for overheating system components. Additionally, with a rugged, drop-tested design and the safety rating electrical and HVAC professionals’ need, the DM166 is field-ready for demanding applications. It carries a ten-year warranty on both the product and the thermal detector. The post Combining thermal imaging with electrical measurement appeared first on EE Publishers.